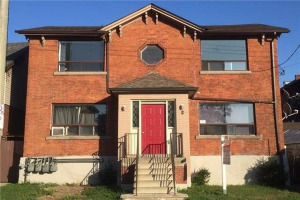 Fantastic Opportunity To Rent This Gorgeous 2 Bedroom, 1 Bath Unit With Laundry & Parking! Fantastic Kitchen W'white Cabinetry, Stainless Appliances, And Breakfast Island! Spacious Living Room With Laminate Floors & High Ceilings. Gorgeous Main 4 Pc Bath W'shower Tub Combo And Oversized Vanity. 2 Spacious Bdrms W'dbl Closets & Laminate. Aaa Tenants Only!